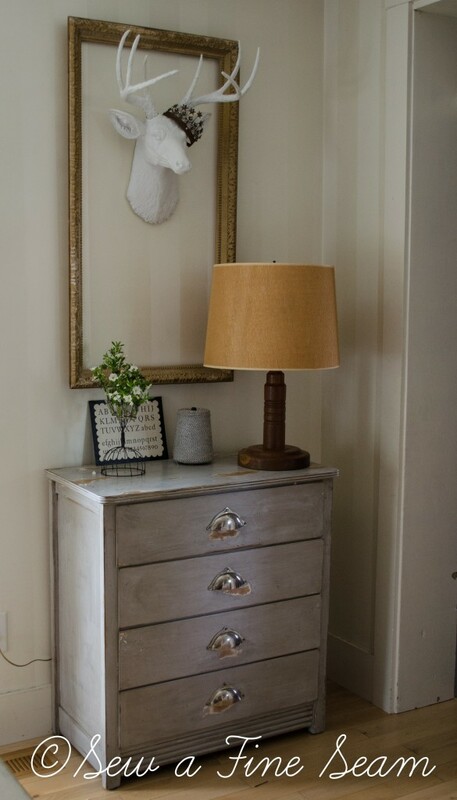 I have this darling grey dresser. It used to be white and my Mom used it for a changing table for me when I was a baby. I used it for my first daughter’s changing table. 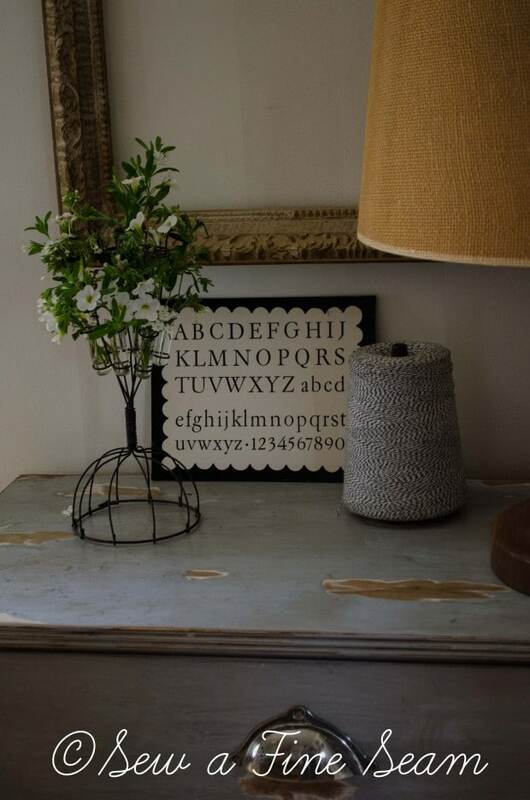 When she was a couple years old the trend of painted furniture began and I fell in love. I decided this dresser was the perfect piece to try my hand at painting furniture. I didn’t know much of anything about painting furniture but I’d seen some stuff a friend had done and figured ‘how hard can it be?’ My friend offered to help me with distressing it and long story short she ended up doing the distressing and staining for me. I loved the result and I still love it. It’s moved around the past few years but it is one piece I’ve never considered selling. My dining room was recently featured on Savvy Southern Style blog as part of Kim’s famous ‘My Favorite Room’ series. My dining room is where the dresser started out after it received its makeover. A couple years ago there was a wood bench and my chalk board art in this spot in the dining room. Before that there was a dresser here that had been my hubby’s when he was little. Back in 2008 when I started blogging that dresser was black. I eventually painted it white as I got SO OVER the black trend and just wanted everything white. 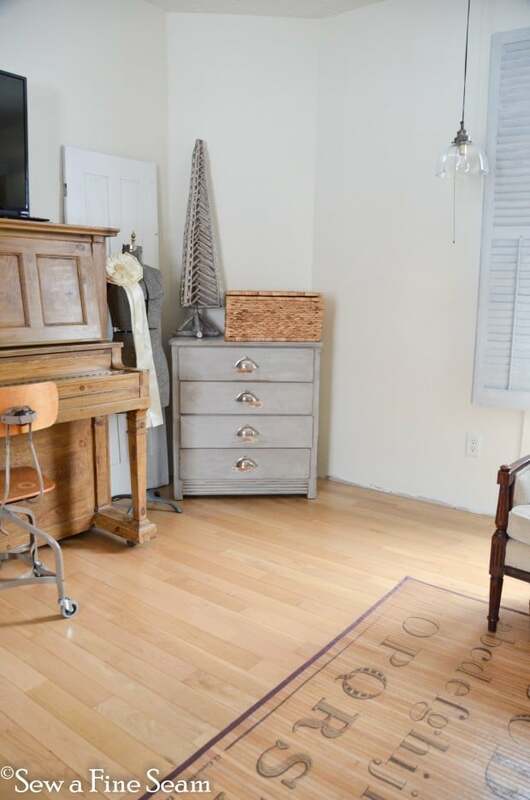 I looked for pics of that and of the grey dresser I’m talking about but didn’t find anything. 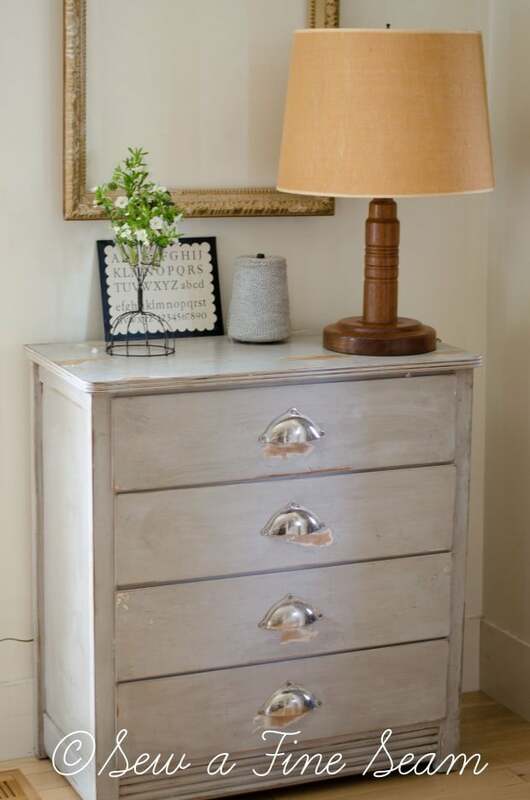 The grey dresser was a LONG time ago – before I started blogging. I know there are some pics of it on the blog somewhere but I got tired of digging and let it go. Most recently the grey dresser has been in the living room. It landed here when I did some furniture shuffling and wasn’t quite sure where this should go. I didn’t love it here but it was a place to put it while I figured out where to put it that I really loved it. And it finally found its way to its proper spot last week. You see I bought a new clock. And it needed to go on the wall above the dresser. And then I decided to switch the dresser with the cupboard in the kitchen. 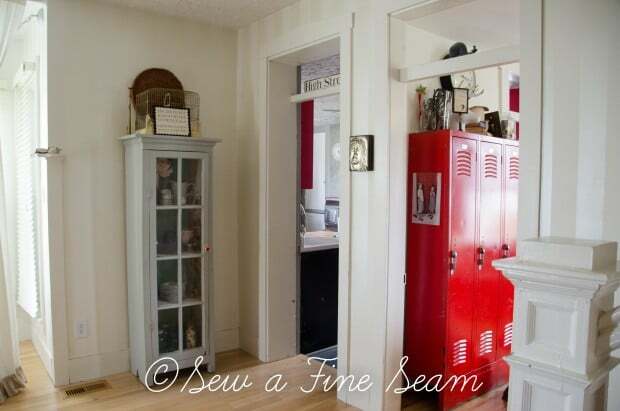 I’ll share pics of the other cupboard in the living room soon but right now you can hardly see the cupboard because all my furniture makeovers for The Summer Market are stacked in front of it! Here it is today, back in the spot I loved it most. We used it in the bathroom for a few years as it worked well in there as a dresser for baby things and a changing table. But I always kind of missed it being here. It’s a great spot to set food when serving a meal in the dining room (I have to clear the decor of course) and it’s a wonderful spot to set my camera during photo shoots. It can become a catch all, but it’s a good spot for one, and I don’t let it become over loaded because it’s one of the first things you see when you come in the front door. This lamp I recently found at Goodwill. My intention was to paint the base a fun aqua color and add it to my stash of stuff that is headed to The Summer Market the end of July. But it landed here and I sort of fell in love with it. It’s so fun to have a lamp here at night. And the burlap shade is so cool. The drawer pulls on this piece are so amazing. I can’t even tell you where they are from – a friend of mine who had a shop at the time ordered them for me. And that’s how my grey dresser ended up back in its proper place after being shuffled and moved around for a few years. I’m happy with it. And I’m totally loving the cupboard that was here in its new location too. That looks darling – great job! 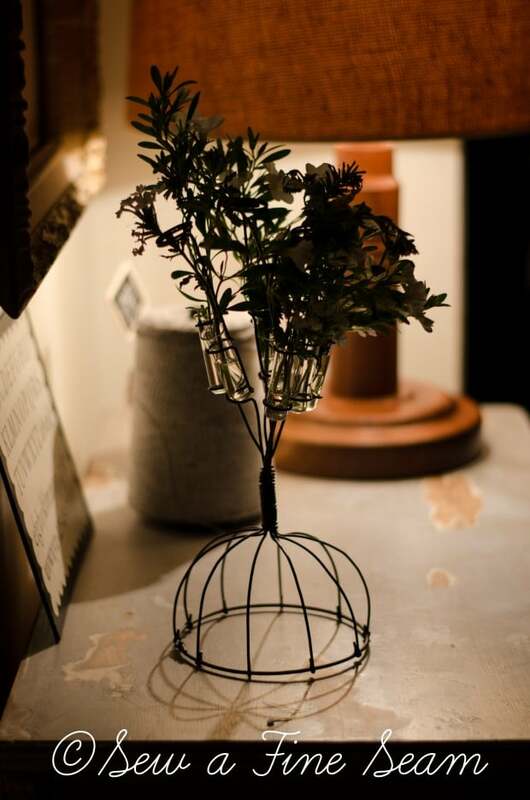 nice to have the family history with such an attractive and adaptable piece. Thanks Brenda – we all are loving having it back here. Thanks Cheryl Ann! I don’t want to ever part with it 🙂 Right now it holds dvds, sheet music and some of the smalls I’ve made for my business. Thanks Daniela! I’m loving having a lamp there – it’s a bit big for the space but if I decide it has to go I will definitely be replacing it with another lamp! I love that dresser! The silver pulls on it and the heavy distressing give it a lot of charm. 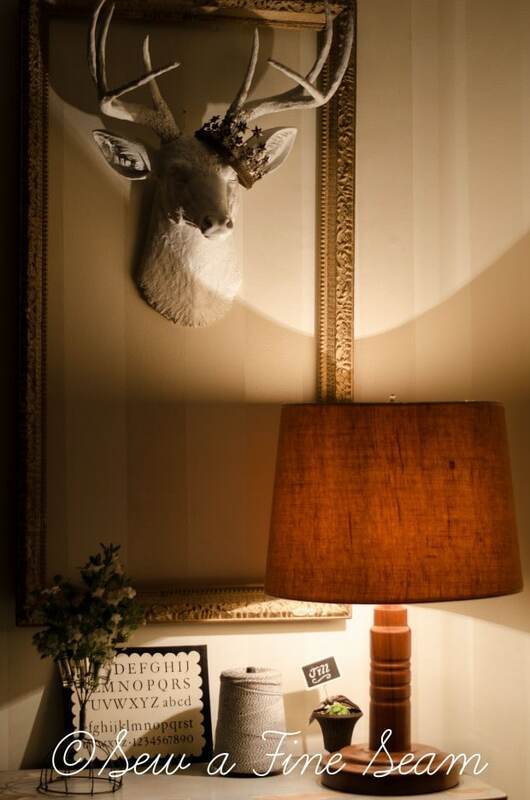 I also like the framed deer head wearing a crown. Such a cute display! Sometimes it just takes awhile to feel right about where something goes. Maybe we think we have to do something fantastic in our own minds. Your vignette is perfect where and how you have it. I love how it looks, the deer with crown on his head is priceless, little bit of humor and cute in his frame. Deer heads are so versatile, conversation starters and adorable, especially when somebody fun like you puts a crown on his head. Are you going to do something fun for July 4th? Looks like I’ll be doing what ever I do alone, will take dog to lake, he loves to swim. Will have to get up early to get a parking spot and a spot in the park. Gets very busy on July 4th. Tomorrow I’ll go get some bottled ice tea to drink. Will just take a small cooler. I have my grocery cart to carry things down to grass at lake. Looking forward to enjoying a day floating and swimming with Tommy. Have fun whatever you do. Hope your day is going great JaneEllen! I’m in Kansas with my sister enjoying a lovely day! I took a long nap and we are going to fireworks tonight!